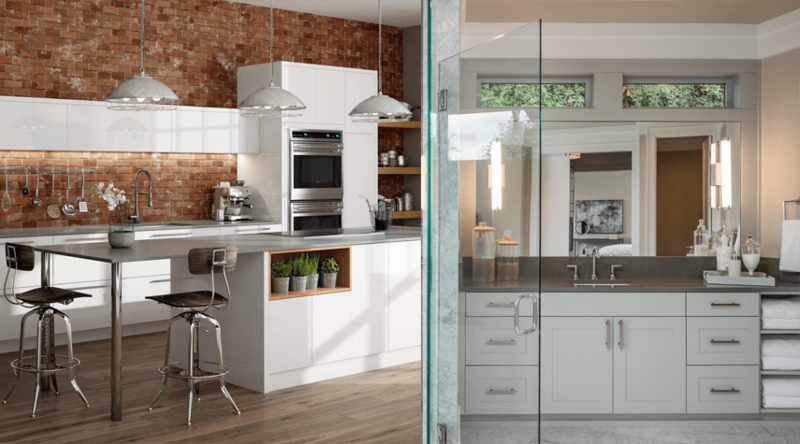 The Showroom Interior Solutions is the premier destination to select new cabinets for your kitchen and bathroom, if you live in Olympia, Lacey, Tumwater, Yelm, the wider Thurston County and surrounding areas. The Showroom Interior Solutions team of design experts have an in-depth understanding of how important it is to choose a cabinet solution that meets your style aspirations, while catering to all your functionality needs, and will be more than happy to assist you every step of the way, to make the selection of cabinet doors, hardware and style literally pain-free. 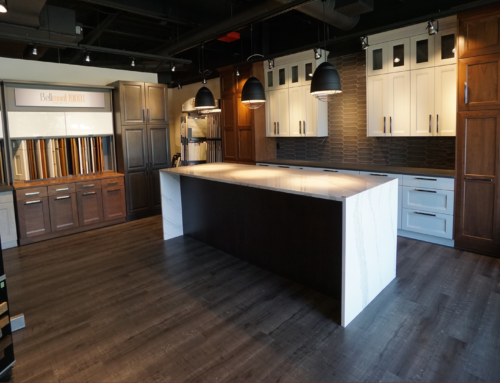 The Showroom Interior Solutions uses reputable vendors, offering a vast array of highly customizable cabinet doors, hardware and styles, manufactured to high standards of quality and available in a wide range of materials. When you contact The Showroom Interior Solutions to enquire about assistance with your kitchen and bathroom cabinet selection, overall project design options, and professional installation services, you have already decided that you want the support of an expert team that will ensure you have the required knowledge, resources and support to make the best choices for your lifestyle, as you bring your project to life. The Showroom Interior Solutions stands for excellent customer service and experience, which is why the following information has been compiled to provide a high-level overview of important aspects to consider by customers who are on the market for new cabinets, or to help decision-making when it comes to the timing of cabinet replacement. Contact The Showroom Interior Solutions today and let us guide you through all aspects of an exciting journey. Arrange furniture and other accessories. 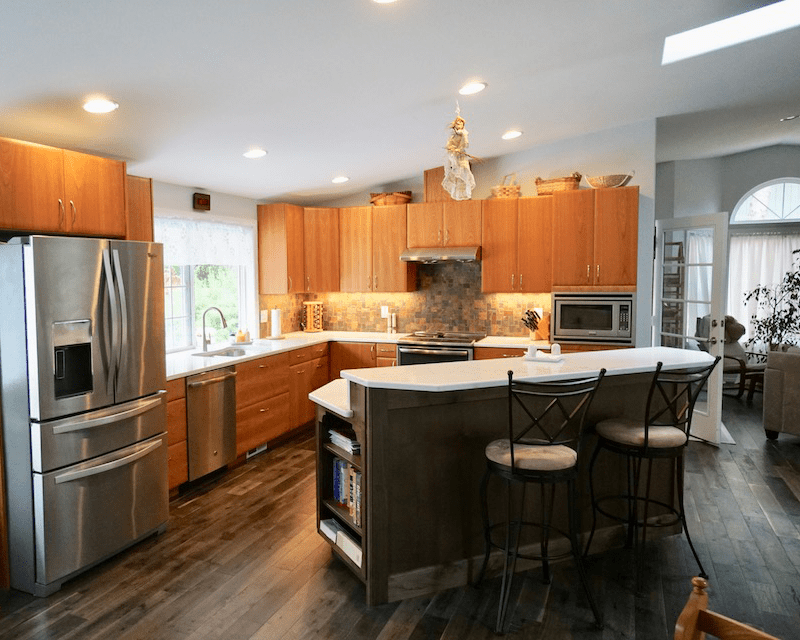 Proper planning is essential before starting any type of kitchen and bathroom renovation, or remodel, and selecting the right cabinets is a very important part of the process. The right choice of color and materials for your kitchen and bathroom cabinets can help enhance lighting levels. Nobody likes to knock a body part on a countertop corner, or have to reach far to fetch an accessory that is required when preparing food in the kitchen, or getting ready in the bathroom. Particularly if there is more than one person in the room. Spaces that are too small, or too large, are the result of poorly designed layouts and hinder the efficient and comfortable use of a kitchen, or bathroom. Adapting the cabinet layout to the space available in your kitchen and bathroom is an important part of the process. In the past, it was enough for kitchens and bathrooms to be functional. Nowadays, both rooms are important decorative components of a house. It is crucial to leverage kitchen and bathroom projects to select a style of cabinets that combines aesthetics and functionality, while complementing the rest of the house. When appliances and accessories become outdated, inefficient, or damaged, there is an opportunity to take advantage of a kitchen, or bathroom, remodel to swap them out for something that better suits your current lifestyle (e.g. children have grown up and left the house). As modern appliances and accessories often have different dimensions to conventional ones, a renovation project will enable you to integrate them in the new design and manage the space they occupy in harmony with newly selected cabinets. Kitchen and bathroom cabinets, and countertops, have an average life cycle of 10-15 years. When it comes to their replacement, why not go the extra mile and design a project that will optimize use of space, while combining style and functionality? Cabinets are a component that define the style and design of your kitchen, or bathroom. Therefore, The Showroom Interior Solutions design experts recommend that you take ample time to carefully explore your options before making a considered decision that will put a personalized and tailored stamp on your new, remodel, or renovation project. When it comes to choosing kitchen and bathroom cabinets, it is not always easy to know where to start. The following stages provide some high-level guidelines that can be further explored when discussing overall design with The Showroom Interior Solutions experts. The Showroom Interior Solutions knows that kitchen and bathroom cabinets are found in all styles and materials, and that this is the first layer of complexity when it comes to making the right cabinet choice. It is therefore required to give some considered thought to the desired type of materials, as well as the style of design to be applied to your kitchen, or bathroom, as a whole. When choosing a design style, it is also important to consider the type of door, cabinet and hardware. The three stages outlined below will help prepare yourself for the selection of all cabinet components without losing heart, knowing that The Showroom Interior Solutions design experts will always be there to guide you through the entire process, from concept to finished project. The raised panel cabinet door is similar to the paneled door with the addition of molding. The second stage involves the selection of hardware that will be installed on the kitchen, or bathroom, cabinet doors. This includes, but is not limited to, handles and knobs that will be used to open the cabinet doors. During this stage, budget considerations can be accommodated, as cabinet door hardware comes in a wide range of price points and limited budgets can achieve a great result by exploring options with The Showroom Interior Solutions design experts. From a purely practical perspective, The Showroom Interior Solutions recommends the selection of handles over knobs, as they come in such a wide variety of styles that they can virtually accommodate any kitchen, or bathroom, cabinet design. Finally, once the choice of panel and hardware has been made, it is time to move on to the third stage and focus on the cabinet finish. The two most popular choices are natural and stained wood. In both cases, available options come in a wide range of price points. Moreover, both types of wood come in a wide range of options. Both cabinet finish options are equivalent in terms of wear and tear, so the choice really rests with a desire to design a kitchen, or bathroom, with a look that is either natural, or more colorfully customized. Alternatively, you can also elect for your design to incorporate a cabinet look that is more robust (solid wood), luxurious (veneer wood), inexpensive (melamine), metallic (stainless steel), or that imitates other materials in a stylish fashion (laminate and thermoplastic). 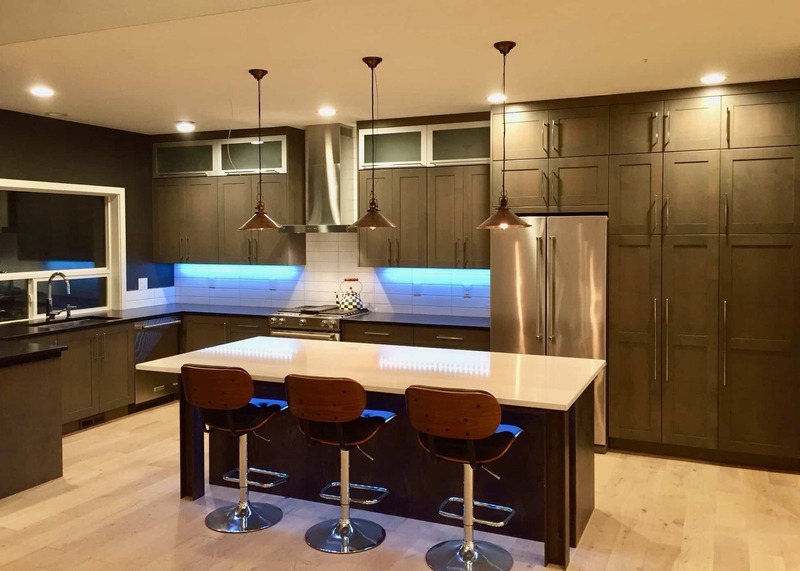 The above three stages serve as a guideline only and The Showroom Interior Solutions design experts strongly recommend that you take a moment to contact them for advice and explore your cabinet options before embarking upon a kitchen, or bathroom, remodel project. Many home owners become eager to renovate their kitchens and bathrooms after living in the same house for many years, or when moving into a newly purchased house. When that point comes, it is also true that they often start by considering the ready-to-assemble options, which are initially thought to be a more hassle-free avenue. Many stores that offer kitchen and bathroom products matching this option carry quality merchandise, but are not really focused on providing a service that will see you through to the end of your renovation project. When choosing a pre-packaged solution that you will have to install yourself, nothing is truly made to measure and will, more often than not, result in loss of space, unusable space, and feel like it was not designed for the room it is installed in. Empty spaces will also very often be covered by paneling, rather than being utilized as cleverly planned storage spaces. The Showroom Interior Solutions design experts will come to your house, inspect the dimensions of the kitchen, or bathroom, you wish to remodel. They will then provide detailed advice when it comes to cabinet style, materials and layout, which will not only help new ideas to surface, but also make the initial part of the journey pain-free. 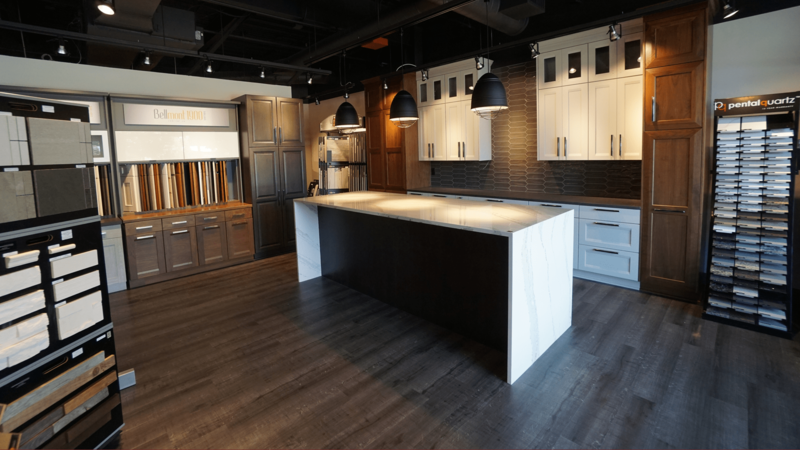 Vendors such as the Bellmont Cabinet Co. and Woodland Cabinetry provide The Showroom Interior Solution with a vast array of highly customizable cabinet options, enabling the design of a kitchen, or bathroom, that will be optimized for the space available in your home. Ensuring that every inch of space is used in a way that combines beautiful style and great functionality. Moreover, The Showroom Interior Solutions offers professional cabinet installation services, which guarantees a seamless transition between the design and installation phases of your project, while keeping the same level of personalized and tailored customer service from start to finish. The Showroom Interior Solutions is your one-stop shop for kitchen and bathroom cabinets, and for new, remodel and renovation interior projects. 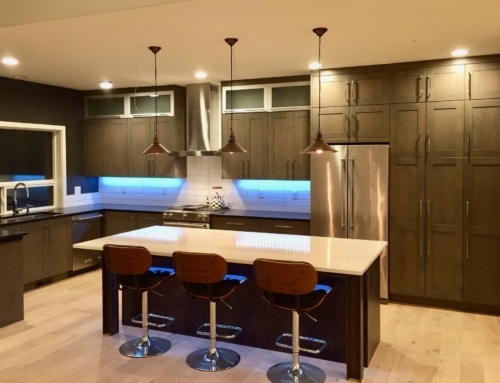 If you live in Olympia, Lacey, Tumwater, Yelm, the wider Thurston County and surrounding areas, The Showroom Interior Solutions offers a unique customer service formula that will support and guide you from conceptual design to a kitchen, or bathroom, you will be proud to call your own and showcase to family and friends. Project support and customer service will be personalized and tailored to your needs. Whether you want to convert your kitchen dream into a dream kitchen, or bathroom dream into a dream bathroom, The Showroom Interior Solutions team has the experience, expertise and professionalism to ensure your project is an experience you will keep as a great memory for years to come. Contact us today and let us partner up to embark upon an enjoyable creative journey, as we explore the vast range of available cabinets and find a solution that is the best fit for your kitchen, or bathroom.